Around this time Carrie and Will arrived in their SUV; a few minutes later, Dennis rode in on their aluminum outdoor motorboat. Dennis and Carrie were dismissive of my insistence on going to the store; Dennis didn’t see the need for the caulk; Carrie didn’t want to have to build up her chi to do a big work project so soon after their arrival. I assured her that this way my initiative; they didn’t have to lift a finger. Lolly wasn’t much into making a trip, but I insisted: What was the big deal? We had a window of opportunity; it was warm and sunny; let’s do it. At the hardware store, in nearby Houston (Houston, Alaska, a small town we passed en route to the cabin), I saw a disposable paper jump suit. “What a great idea”, thought I. “Now I wont have to mess up my clothes”. However there was only one size available, which was just BARELY fit. I gave myself a wedgie every time I lifted my arms my shoulders to the great amusement to the spectating swimmers and sunbathers. I posed for several photos. A straw sun hat completed the ensemble. The jump suit’s too-smallness also verged on the dangerous: If I reached out too far to the left, the paper fabric threatened to pull me off balance, which was precarious in any case. As time wore on, I was worried that I’d run out of steam. I have weak ankles that can start to pain me if I’m on them for more than an hour. I worked alone for much of the time. 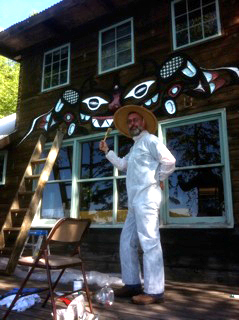 Lolly joined me after a while, painting most of the window frame, and Amy finished up. 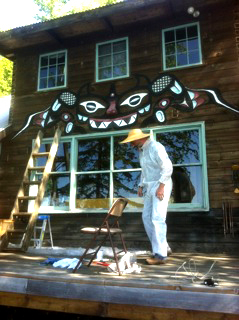 I repainted about half of the Tlingit dragon before I ran out of steam and had to give up for the day, although I helped Lolly and Amy with the parts of the window frame they couldn’t reach. Early on, Mom kibitzed that her primary concern was the window frame, not the dragon. I was annoyed; there were four other adults loitering around who could join in any time they wished. I diplomatically pointed out that the new caulk needed time to dry before it could be painted. We finished up around 7:30 PM, when Dennis fired up his propane grill and cooked up cheeseburgers and corn on the cob.